Extension-style kits feature premium, brass cutter block with contoured edges to minimize gasket material buckling and assure precision cuts. Ergonomic design offers secure, comfortable grip. Easy-to-read, engraved, precision scale. Sliding, knurled nut adjusts cutting radius. Chrome-plated, steel extension bars provide for cuts up to 61" (1550mm) in diameter. Hex screws hold cutting blade for cuts up to A?" (19.05mm) in depth. 18" x 18" (457mm x 457mm) cutting board features plastic non-slip, textured surface that reduces blade friction, minimizes breakage, and self-heals after each use. 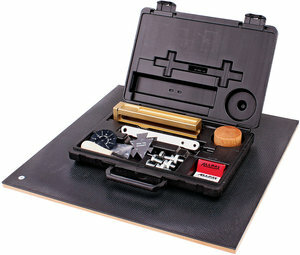 Includes rugged storage case, dove-tail designer template, bolt hole locator template, and center pin handle. cutters are often preferred for cutting non-rigid or non-metallic gasket materials. This item ships from the manufacturer within 7 days.